PLEASE NOTE: THE OPEN TOP CANS ON THESE PAGES ARE FOR USE WITH COMMERCIAL CANNING MACHINES AND FOR INDUSTRIAL USE. THE TOP OF THE CAN IS SHARP, AND SO THESE CANS ARE NOT SUITABLE FOR RETAIL OR PERSONAL USE. 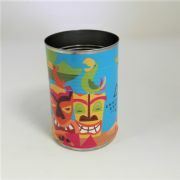 This can size is the standard baked bean tin size that you can see in the supermarket, 73 mm indiameter and 110 mm high, and has a choice of 4 lids.